Quality, performance and efficiency. This is Dassault Falcon. These are the hallmarks of every jet Dassault Aviation makes. And this is the design philosophy that provides the highest standards of excellence for Falcon customers. These pillars of design are also what makes Falcon aircraft so advanced, refined, comfortable and beautiful â€“ just as Dassault’s founder, Marcel Dassault insisted. From design to manufacturing, Dassault Falcon has cultivated a deep-rooted culture of precision and collaboration. And they evolve and improve, the latest technical developments and design innovations are being introduced and implemented. Dassault Aviation launched on May 19, 2014, the Falcon 8X, the newest addition to the Falcon family in the ultra-longrange category, at EBACE 2014. Ground tests, including flight control system testing, vibration tests and fuel system testing, concluded in November. The first engine run up took place in early December. And on December 17 it was rolled out for the first time from Dassault’s Bordeaux-MÃ©rignac facility. On February 6, 2015, Falcon 8X s/n 01 took to the skies for the first time with test pilots, Eric GÃ©rard and HervÃ© Laverne, at the controls. The flagship 8X lifted off at 2:00 p.m., with the first flight lasting 1 hour and 45 minutes. During the flight, the airplane climbed to FL400 (12,000 m) accelerating to Mach 0.80. All systems performed as expected. This marks the beginning of an intensive flight test campaign which will involve three aircraft for both flight testing and certification â€“ scheduled for mid-2016. The airplane will soon be relocated to the Dassault Aviation Flight Test Centre in Istres, in Southern France. The centre contains the most advanced monitoring and telemetry equipment in the industry. It is there that Dassault has developed sophisticated tests for its Falcons, fighter jets and more recently, the nEUROn unmanned combat aircraft. Besides exploring the flight envelope and systems testing, the flight test programme will include intensive endurance campaigns in order to ensure a smooth entry into service, which is expected in the second half of 2016. Fly farther, Achieve more - Falcon 8X can fly farther, in greater comfort, and with even more efficiency. Its ultra-long range connects Hong Kong and Paris, London and Cape Town, Los Angeles and Beijing. Its cabin â€” the longest in the Falcon family â€” provides more comfort and a stunning choice of more than 30 distinct layouts. And thanks to overall design enhancements, the 8X is every bit as fuel-efficient as the Falcon 7X. The Falcon 8X continues Falcon traditions of efficiency, performance, flexibility and comfort, while saving millions in total life-cycle costs versus any rival. Once again, Dassault is stretching the boundaries of what a business jet can do for the customer, helping the customer accomplish more. Reach beyond - With 6,450 nm (11,945 km) range and outstanding short-field performance, the 8X links important city pairs non-stop and accesses 500 more airports in the US alone than its competitors. Then there’s the superlative airfield performance of the Falcon 8X, which adds even more reach beyond other aircraft in its class. Steep and strong, hot and high - Steep approach angles and strong climb-out gradients are no problem for the Falcon 8X. Nor are hot and high conditions. And it delivers superior range from both. It is the only ultra-long-range business jet that can use London City’s 3,934 foot (1,200 m) runway. And after take-off, it can fly non-stop to Dubai or New York. Or departing Eagle, Colorado, an elevation above 6,500 ft (1,980 m), it can fly non-stop to Geneva, Switzerland. More Range After Short Hops - The Falcon 8X can land at 85 per cent of its maximum landing weight. So one can fuel up at home base and make a short hop before flying a longer leg of more than 4,500 nm (8,334 km) without refuelling. It’s a capability that can save the customer money on home-based fuel and also boost mission flexibility. The tri-jet advantage - Thanks to its three engines, which shorten transoceanic routes, the Falcon 8X flies faster. They also contribute to the 8X’s slow and stable approach speed â€” a mere 106 knots (197 kmph). And its three-engine performance margins allow take-offs from shorter runways. Unbeatable economics - Falcon 8X direct operating costs are as much as 35 per cent lower than those of competing jets. And thanks to its optimised airliner-type MSG-3 maintenance programme, time between 8X major inspections is 800 hours or 12 months, giving greater use of the airborne asset. Not just bigger, better - When designing the Falcon 8X, Dassault rethought all major structures and systems, adapting and optimising them into an integrated, efficient airframe. New internal wing architecture both lightens the wing structure and provides more room for fuel. New winglets reduce drag to boost efficiency. The fuselage houses more fuel without reducing passenger space. Landing gear has been reinforced to provide for additional payload. A visionary flight deck - Totally redesigned, the Falcon 8X cockpit will feature a new generation of EASy flight deck and offer an optional wide-screen head-up display, integrating enhanced and synthetic vision for vastly improved situational awareness in low-visibility conditions. It will also feature Honeywell’s next-generation 3D color weather radar system with enhanced turbulence detection capability. PW307D engines: more thrust with less fuel - At 6,722 pounds (29.9 kN), these enhanced Pratt & Whitney Canada turbofans deliver five per cent more thrust, yet they also lower fuel consumption. Beyond delivering more pounds of thrust for each pound of fuel, they reduce NOx emissions 30 per cent below today’s most stringent standards. The PW300 series has more than 12 million hours of proven, highly reliable operation. More moving control surfaces - The 8X wing takes advantage of more moving control surfaces, including three leading edge slats, three airbrakes and two flaps. Dassault’s latest generation of digital flight control technology ensures smooth and precise flight path control and flight envelope protection. The Digital Flight Control System (DFCS) features three main flight computers that receive control inputs and direct control movement, backed up by three secondary computers. An analog computer controlling the two flight spoilers using rudder pedal displacement, and the trimmable horizontal stabiliser, via the pitch trim switch, provide the ultimate back-up in the event of computer failure. The computers permit precise flight path control. Using the fighter-jet styled side stick controller, the pilot follows a single flight path vector (FPV) cue. The DFCS handles autotrim adjustments, optimises the configuration and provides stability augmentation. The DFCS’s computers also provide built-in flight envelope protection, allowing pilots to extract maximum aircraft performance and efficiency without risk of overstressing the aircraft. They monitor pilot flight control inputs and prevent the aircraft from exceeding angle-of-attack, airspeed/Mach or load limits. This feature is invaluable in instances where maximum performance is needed such as when encountering wind shear or taking collision avoidance manoeuvres. 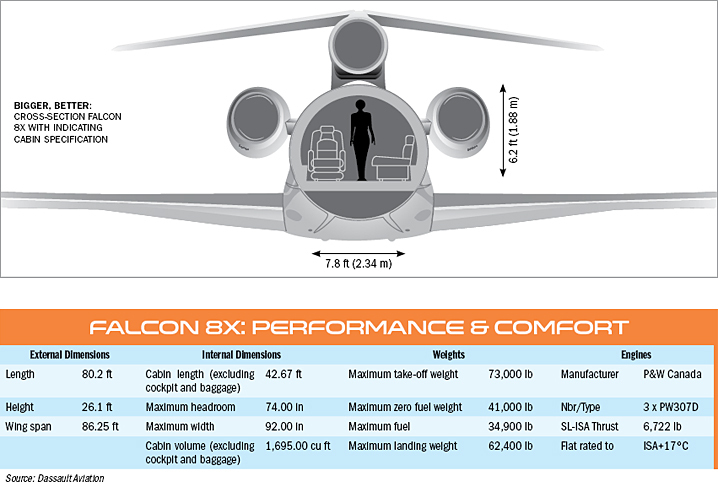 More cabin and more flexible cabin - This is Dassault Falcon’s longest cabin. And every inch is used to advantage. With over 30 possible layouts, this is the industry’s most flexible cabin and the one most likely to offer an interior solution that meets exacting requirements. Noise and cabin altitude are low. Air quality is high. And connectivity is complete in this Wi-Fi environment, which is equipped with the latest FalconCabin HD+ cabin management system. Benefits you can feel - While current airliners and even some business jets have cabin altitudes of 6,000 to 8,000 feet, the Falcon 8X keeps the passenger comfortable at 3,900 while cruising at 40,000 feet, with less jet lag. Noise level is also low at a whisper-quiet 52 dB. Long on comfort and choice - Three extra feet can accommodate a lot more living space. Customers can opt for a very comfortable three-lounge cabin with a shower aft and crew rest provisions forward. Or they can go shorter on the entryway to add even more lounge space. Or one can select a large entryway with spacious, lie-flat crew quarters and a truly grand galley for multiple meals. There are over 30 different cabin layouts from which to choose.